That question was recently asked of me by one of my son’s friends. From the mouths of babes, eh? It is, however, just a much more blunt and direct expression of the same sort of conversation I have been having intermittently with people over the past two years. It seems that in a suburb where most households are dual income, people find it most peculiar that we have chosen for me to be a full-time stay-home parent. Our move to America two years ago initiated my first experience of being “just” a Stay At Home Mother. I write “just” to be clear that I do not disparage the role of the SAHM. There is nothing simple, easy or straightforward about making the choice to step away from a career and be with your kids full-time. I also think it is a brilliant thing for women to be in a position to make an active choice as to whether they want to be parents or not and, if they are mothers, what balance they wish to strike between paid employment and raising kids. However, our immigration was my first experience of being home with the kids full-time, with nothing else going on in my life, and I admit it has been a bit of a tricky transition. I had actually only been in paid employment for a fraction of my years as a parent even in Scotland. However, even when not in paid employment, I had a pretty demanding but rewarding voluntary job, serving on my local Children’s Panel, and I was also involved with various groups in the community, serving on different committees. All these commitments and obligations kept my brain stimulated and ticking over during the baby years, gave me a welcome break from household chores and childcare, and permitted me to feel as if I was still contributing something to society – even after I stepped away from my teaching career. All the volunteering was like keeping if not a foot then a toe in the door of employment, and gave my life an additional dimension that made it easier for me to transition into being a SAHM. Perhaps because I was always so busy or perhaps because I lived in a more traditional community, nobody back in Argyll every queried our choice for me to be home with the kids. It might not have been their choice but they understood it and respected it. Moving to the Philly suburbs, therefore, has been an interesting experience in that it has been not only my first experience of being “just” a SAHM but also the first time I have repeatedly had to explain and even justify that choice. It feels harder to justify these days too because none of my kids are babies any more. Nor are any of them preschoolers. Since September 2014, all four of my kids have been in full-time education. I, therefore, have a good chunk of the day when school is in session where I am not actively fulfilling the childcare element of my SAHM role. Of course, six people generate a lot of laundry and other mess and require a whole load of cooking to be done so I am kept plenty busy. Now that I have the kids in school though I am able to grab just a wee bit of time for myself each day but I don’t think an investment of time in self-care needs to be justified. Still, however, when people – and obviously I meet a lot more new people than I did back in Argyll – do that whole small talk thing and inquire as to where I work or what I do for a living, I detect something in their unspoken reaction that makes me feel they think I ought to be justifying my role as a SAHM. I think some people regard it as a luxury whereas I regard the ability to make the choice the luxury. Of course, choice is defined by context. I might be considering a return to paid employment now that we are pretty settled in America if circumstances and our family dynamic were different. Between me needing to convert my qualifications, the high cost of childcare and – mostly – the demands of my husband’s job, there seems little opportunity for me to return to paid work outside the home at this time. Ultimately, as tricky as I have found the transition to being “just” a SAHM – largely because it has formed part of a larger process of change – it is our choice, mine and my husband’s, and is therefore, of no concern to anyone else. Really, therefore, the answer to the question of what I do all day is that it is none of anyone else’s business. It’s a household and family dynamic that works for we Picts, all six of us, and that is absolutely all that matters. 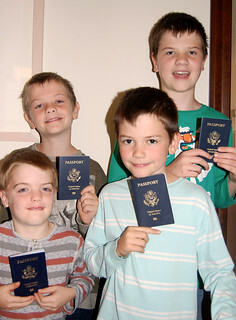 Under the Child Citizenship Act, our four sons- as the children of a US citizen and permanently residing in America – became US citizens when we emigrated here in October 2013. However, in order to make that officially part of the record and make it concrete and provable, we had the option of either applying for a Certificate of Citizenship or a US passport. We thought the passports were a better option so that was what we decided to do. We filled in the forms and took them to the Post Office for checking and processing. Just as in Britain, there is a fee attached for this service but it is a more sound and secure way to submit a passport application so is well worth the money. We could not, however, get the Post Office person handling the paperworks to appreciate that the applications were being submitted under the Child Citizenship Act rather than by standard birth-right. We talked it through with him several times and he got the idea on some level but not that there was a requirement for additional supporting evidence regarding the boys’ residency qualification. Finally my husband insisted that he enclose at least copies of their Green Cards and other such documentation with the applications. We were not surprised, therefore, when a month later four identical envelopes appeared in my mail box all bearing the same message from the US Department of State: we needed to submit a whole bundle of supporting evidence within 90 days or else all four applications would be void. This was so supremely frustrating that it made me want to primal scream. It was also far too reminiscent of the beauracratic tangles and annoyance of the Green Card saga. 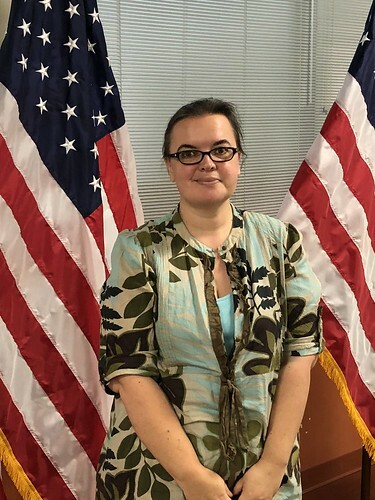 A phone call to the relevant section of the State Department confirmed how to handle having only one original copy of our Marriage Certificate to split between four applications and that we only had to send all the boys’ Green Cards to evidence the residency qualification. All of which could have been done at the Post Office. We essentially paid the PO’s handling fee just so they would get the applications from A to B and nothing more. Thankfully – unlike the debacle with my oldest son’s Social Security card and Green Card – this was the only glitch in the bureaucratic path and a few days ago four envelopes appeared in the mailbox, each containing a US passport. Of course, there is still an opportunity for a stuff up as there always is – they have not yet returned our marriage certificate or the Green Cards – but for now it looks like the passport saga is at an end. Our sons are now, after two years of living here, officially dual nationals and will be legally recognised as American citizens. I am now the only Pict family member who remains un-American. This Presidential election, however, increases my frustration at not being permitted to vote so I may have to make my own citizenship my next big bureaucratic project. Today marks two years since the kids and I emigrated to America. In some ways it seems like not that much time has passed (such as when we met up with friends in Lochgilphead in July and it felt like we had only been gone for weeks) but in many ways it feels like ages ago, not quite part of another lifetime but not far off. For example, we bought our house just over a year ago but already it feels comfortably like home, as if we have lived in it for years. I reread my first year immigration anniversary post and realised that a lot of what I wrote then still stands now so settling is clearly a slow and gradual process for me; but I am definitely more comfortable with things than I was this time last year. Things that were initially unsettling, discombobulating, strange, alien and stressful have now largely settled into the rhythm and groove of everyday normality with the occasional panicked peak of being a stranger in a strange land. From the very first, my Scottisness has been a talking point. A week has yet to pass without people commenting on my accent, always complimentary, usually an exclamation of, “I love your accent!” Often that is where the conversation on my accent ends but sometimes I am asked where I am from and that prompts further conversation. Some of these can be quite peculiar. Last Winter I fell into conversation with a chap who heard my accent and enquired if I was Irish. Man: That’s not a Philly accent. Man: My family are Irish. Me: That’s cool. I’m not Irish though; I’m Scottish. Man: Yeah, my grandparents came over in their 20s. Man: So where in Ireland? Man: Where in Ireland are you from? Me: I’m not. I’m from Scotland. Man: Oh. It’s just that you sound a lot like Sean Connery. Me: Sean Connery is also not Irish. He is also Scottish. Like me. It is perplexing the number of times I have had the “I am not Irish” conversation. I think more people guess I am Irish than guess accurately that I am a Scot. I sometimes also get New Zealander and South African. I think people just hear accented English and plump for an English speaking nation. I had assumed that Americans would be much better at placing accents given there is such a diversity of accents and dialects in the various regions of the US but apparently not. When people do know I am Scottish, all sorts of bizarre small talk can ensue. One of my favourites was when, not long after moving to America, I was asked at the supermarket checkout, “Do you believe?” I was desperately confused by the question. Having had a lot of strangers ask me what religion I was since my arrival, my first thought was that I was being asked about faith. But why would someone be asking me about religion while beeping my groceries? I must have looked dim for long enough that the checkout lady offered a follow up, “Do you believe in the Loch Ness Monster?” Oh! Much easier to answer. She looked quite crestfallen when I replied, “I believe Nessie is good for tourism”. Did she really think I was going to reveal that I had been given a private audience with the beastie? That was not the only time I have been asked about Nessie but it was certainly the oddest. Haggis is another topic of conversation. I think Britain still has a reputation for terrible food (which is unfair – you can find wonderful and wretched food wherever you are in the world) and the very notion that someone might eat the heart and lungs of a sheep all chopped up and stuffed in its bladder is barf-inducing to some and the idea that such a recipe would become a national dish is truly mystifying. But, of course, many nation’s have a simple peasant dish to serve as their national dish. It is just the fact that Scotland’s is a whole bunch of innards that captures the imagination I suppose. Mostly people just want to know why. Why? Why would anyone eat such a thing? Just why? I can then take the conversation along a historic or gastronomic track. The former involves explaining a bit about crofting practices and the economic need to use every part of an animal and the latter involves explaining that haggis is actually very tasty, thanks to the mixture of oatmeal and spices – though, of course, since I don’t eat meat I only eat vegetarian haggis. I managed to horrify my son’s class when they thought I was going to make them eat haggis. The expansion of the British royal family has led to two periods since my immigration in which people have asked my opinion about royal babies. I don’t tend to have opinions about babies, whether royal or serf or anything in between. People also tended to approach the subject obliquely and without any context so that I again found myself in a state of befuddlement. “What do you think of the baby?” I was asked, again at a supermarket checkout. I asked what baby and was met with the reply, “Baby George?” I still had nothing. Was this some TV programme the checkout person assumed I watched. “Prince George?” Oh. The penny dropped. It’s always nice when people who want a baby have one. That’s pretty much my sole opinion on the matter. And, of course, it was repeated when Prince George’s little sister was born a few months ago. I was quicker on the uptake with that conversation starter though. I get asked about the Queen a lot too. And Downton Abbey. I think many people think the two are related. The popularity of the Outlander series of books and the subsequent TV show is also something people ask me about a lot when they identify my accent. They always look disappointed in me when I confess that I have neither read the books or seen the TV show. Before I had ever heard of the books, I fell into conversation with an older lady in our library once because she heard my accent and wanted to know what I thought of them. She looked downright affronted when I told her I had no idea what she was referring to. She looked like she thought I should be stripped of my Scottish identity. Then it emerged that some of the teachers at my sons’ Elementary School were obsessed with the books – totally obsessed – so they would ask me about all sorts of things to do with Scotland. One asked me to email her photos I had taken of Scottish castles and was over the moon when I did so. Ever so often, someone will hear my Scottish burr and will engage me in conversation about travel to Scotland. It might be that they want to share their experience of visiting the country and tell me how much they loved it there, despite the weather, or it might be that they are planning a trip there and want some personal recommendations. That’s always fun. I think Scotland is one of the most beautiful, historically rich and culturally interesting countries in the world and I am happy to be an Ambassador – though I don’t forget to mention rain and midgies. I welcome all of these little interactions about my Scottish accent and identity. I like being Scottish so I am happy to chat about it. The reaction people have is overwhelmingly positive too which is a welcoming feeling, especially at times when I might be feeling a little alien and adrift. I am quite happy to be “different” and my difference sometimes prompts people to be very helpful and make suggestions as to places to go, things to see and do. Indeed in the two years that I have lived in Pennsylvania, the only anti-immigration sentiment I have experienced directly was from a man, whose surname I noted was Italian, who felt it appropriate to tell me that people like me were coming over here and making the economy worse because we were stealing all of the jobs that proper Americans should have. Sigh. As a final note on Scottish accents in an American context, as my kids accents and vocabulary are drifting into the Mid-Atlantic, they have become much more conscious of my accent. “You are just SO Scottish!” they proclaim. I find that quite comforting.